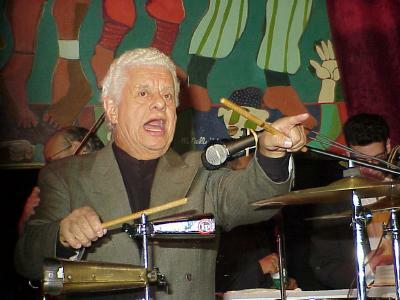 Tito Puente & Tito Puente Jr. at SOB's on 12/27/99. Tito Puente and Tito Puente Jr.
SOB's in New York City on 12/27/99. These photographs were taken at the SOB's nightclub in New York City by J. Fernando Lamadrid on December 27, 1999. All rights reserved and copyright © 1999 www.justsalsa.com. Your feedback is welcome.